A story of HOPE for the children of a remote village high in the Andes Mountains that is home to the world's oldest living people per capita. Learn how a compilation of research and discovery about this unique "Sacred Valley" leads to the founding of The Andes Children's Foundation. Vilcabamba - Sacred Valley of the Centenarians holds the secrets of longevity that have been enjoyed by its inhabitants for almost three centuries and could be the promise for longer, more healthy lives for modern, less healthy cultures worldwide. Since 1971, when Alexander Leaf from the Harvard Medical School was commissioned by National Geographic Magazine to research the centenarians diet, habits and reported lack of diseases, Vilcabamba has been the focus by science and the nutrition indusrties. Many believe Vilcabamba's environment, position at the ecuator, abundance of antioxidant-rich fruits (over 70 varieties) and drinking waters (with naturally-chelated minerals) hold the secret to a longer, more youthful life. Follow the adventures of a modern day Ponce de Leon, Craig Keeland, as he travels to Vilcabamba to bring back the secret to be included in new PhytoTonics he has developed through his companies magaed under CK Management of Plano, TX. 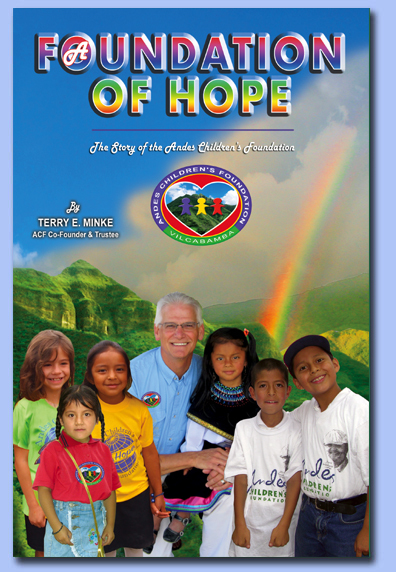 Travel with the ACF Educational Mission Trips Leader, Terry Minke as he narrates the life-changing adventures expereinced by all who have participated in the annual trips to visit these beautiful and loving children of the Andes Mountains. Learn about a program which has been started as a U.S. 501C(3) charity, The Andes Children's Foundation, to give back to the people of Vilcabamba for the gift they have shared with us.